Some twins are happy to share a cake, but it’s always worth thinking about whether two cakes would be a better idea. Don’t forget that each child wants to be recognised as an individual as well as a twin. One way to make twin-themed cakes is to use a deliberate focus on twinship, for example making two cakes and icing them with the yin-yang symbol but one in red and blue, the other in pink and green, for example. Other ways to do this are to have intersecting cakes where the theme works for both. Some examples are a square cake decorated to look like a swimming pool and a round cake decorated to resemble a swimming ring or lifebelt or a round cake made to look like a flower and a square cake with a large butterfly iced on it – this kind of linked but separate cake can give twins the best of both worlds, especially if they don’t like the same cake flavours. If you want to push the boat out a little, you can make a cupcake tower, or for something really sophisticated, make Croquembouche – a traditional French cake which translates as ‘crack in the mouth’ a perfect way to describe the crisp toffee flavoured caramel and the softer creamy richness of the choux pastry. It’s much easier than it appears. Begin by folding a sheet of greaseproof paper to make a crease down the middle and sift the flour onto it before adding the teaspoon of sugar. This allows you go get the flour into the hot mixture as swiftly as possible, which is essential to making good choux pastry. Now heat 300 ml cold water in a medium-sized saucepan with the butter, stirring over a medium heat with a wooden spoon until the butter has melted. As soon as the mixture begins to rise to the boil, turn off the heat and ‘shoot’ the flour into the mixture with one hand as you beat the mixture fast with the other. You must keep beating until the mixture forms a smooth ball that leaves the sides of the pan clean, it shouldn’t take very long. Then add the beaten eggs, about a tablespoon at a time, making sure each spoonful is thoroughly incorporated before adding the next. Slide the greased baking sheet under water running from the cold tap for a second or two. The idea is to allow beads of water to form on the surface which will create hot steam during cooking to help the pastries rise. Take teaspoons of the choux pastry and place them on the baking sheet an inch apart and bake on a high shelf for ten minutes in the pre-heated oven before increasing the heat to 220 degrees Celsius for a 15-20 minutes. The buns should be crisp and golden – as soon as you remove them from the oven, pierce each one with a skewer to release the trapped steam and cool on a wire rack. Before serving, split the choux buns in half and fill with a teaspoon of cream. 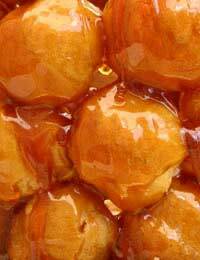 Decorate with caramel by making a syrup of the sugar, water and cream of tartar. Boil until it becomes a golden colour, then take it off the heat immediately. Using a fork, dip each of the cream filled buns in the caramel before arranging on a cake stand or plate in a pyramid shape. If the caramel starts to cool and set before the pyramid is fully assembled, return it to a gentle heat.